True friends respect your boundaries. It can hurt when someone doesn’t like you. Logically, you know you can’t please everyone — although you’ve probably tried and failed like the rest of us. If so, welcome to the party! Personal boundaries based on your values are the best way to determine who you want in your life and who you don’t. If honesty, integrity, and common courtesy are important to you, people with those qualities are a good fit. Pay attention to who you allow into your world. Your life is precious, and being mistreated hurts. When you have supportive people with the same values close to you, it’s a lot easier to let the others go when you realize they are just not a good fit. If you keep them, they will cause you to doubt yourself as in wondering what’s wrong with you or what you did. You might wonder why you don’t feel happy or good around them, or why they seem to purposely disagree with you or dislike you. The truth is, for whatever reason, you two are not a good fit. Period. Remember that YOU have to exhibit the same values you want in other people. Otherwise, you will be on different frequencies (like radio stations) and energetically, you won’t ever meet them. Or, they will inspire the worst in you, which will feel out of alignment with who you truly are. So, if you need to do some personal work of your own, do it now. You may not know someone isn’t aligned with your values right away, so it might come as a surprise down the road. They will undoubtedly show their true colors when they can’t keep up the act anymore. This is an indication they were not living the same values as the people they wanted as friends. Rest assured, these people are just a test. Enforce the boundaries you set by carrying out your pre-determined plan to keep yourself on the right track. In other words, figure out what you will say or do when someone crosses the line (your personal boundary) and DO IT. Immediately. This implementation part is a biggie for women because we’re taught to get along and to not make waves. Sorry, but that gets us stuck in all kinds of detrimental messes. The concept is good, but what our moms didn’t realize is that it doesn’t create a confident, happy, and emotionally healthy woman. Instead, we end up putting ourselves too far down on our priorities list trying to be nice. That leaves us at a deficit, without self-confidence and self-respect, when it’s time to care for people who deserve us. Let me give you an uncomfortable real-life example of something that happened to me. A good friend and I were going to an event and she invited someone else to join us. My gut feeling was to not go because I’d never gotten a good feeling from the other person. She seemed defensive and unhappy when I’d been around her several times previously. I felt like I was walking on eggshells. I decided to go anyway, thinking it would be different. But it was worse. Eye-opening, but worse. The three of us were just sitting down to lunch when she lashed out at me as I shared something I’d seen on TV. She spoke very condescendingly, laughed at me, made jokes at my expense, and shook her head in what appeared to be disdain and disgust. I asked her if she had just said what she said, in order to allow her to explain in case I misunderstood. She just stared as she hid behind sunglasses. She sat stone-faced and silent when I apologized if I had offended her in any way. Her behavior seemed more like someone in a relationship with a long history of negative experiences, rather than an acquaintance who had happily accepted my invitations for fun activities. My friend spoke up and said to just “let it go, and move on,” feeling caught in the middle. While I understand it was uncomfortable, and that ending it quickly would be great, my self-respect doesn’t allow me to “let it go” when someone treats me poorly. So, I excused myself, got up from the lunch table, and left. I stuck to my pre-determined plan of action for when someone trampled my boundaries. Had I stayed, in addition to having a miserable time, I would have clearly stated that it was okay to treat me that way. And that’s what most women do. Because the alternative is uncomfortable for everyone involved. The choice is this: Preserve your self-esteem, have true friends, and get hurt now and then; or cower and cater to a bully, which gives them the power-fix they’re looking for by being mean. 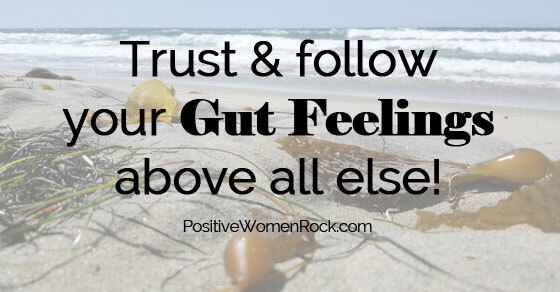 Keep in mind personal boundaries and gut feelings are personal. No one else has to agree, approve, or feel the same feelings. In fact, you and a friend could meet the same person on the same day in the same situation and feel completely opposite about her. Or she may feel comfortable around your friend and not like you. Maybe you remind her of someone she knows and doesn’t like or of a person who hurt her. Or you might be a perfect example of something she wishes she was or has. Who’s to know? My point is, not everyone is a good fit for you, so be discerning about who you let into your heart. Some people puff it up with more love and others will try to break you to feel better about themselves. However, if you don’t put yourself out there with healthy boundaries you enforce with integrity, you won’t find the good friends you deserve. And you won’t get to be a good friend to someone who deserves YOU. Kelly Rudolph, founder of Positive Women Rock, guides women over 40 from stuck and stressed to clear and confident by permanently releasing emotional baggage from the past. Connect with her and get her free Life Strategies now.